Jennifer Lopez is chosen to Represent Motown Artists at the Grammys This Black History Month by performing a Tribute. Jennifer Lopez has been chosen to represent Motown at the Grammys. This Black History Month, The Grammys have chosen Jennifer Lopez to represent Motown. 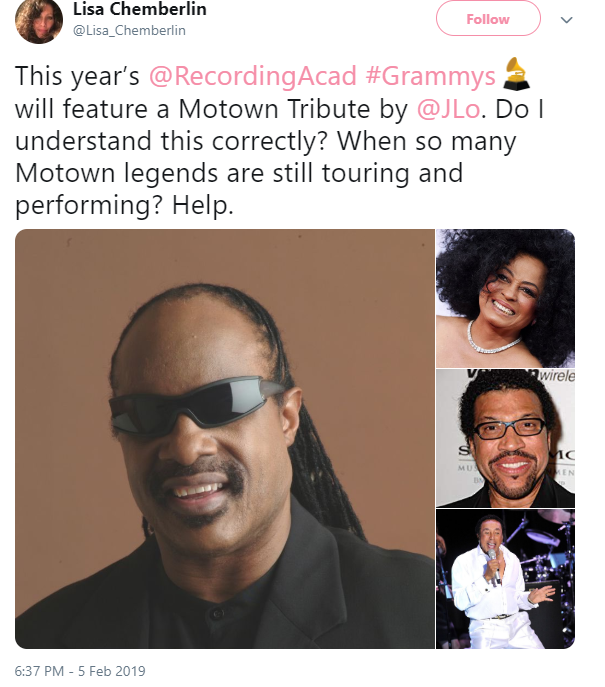 CBS promoted Jennifer on a commercial on Sunday February 4th for the Grammys, and announced she’d be performing a Motown tribute. The Grammys will be held on Sunday February 12. The tribute is to celebrate the 60th Anniversary of Motown Records, and Jennifer Lopez was chosen this Black History Month. Jennifer Lopez. “Motown 60: A Grammy Celebration,” will take place at L.A.’s Microsoft Theater on Feb. 12 and air April 21 on CBS. Fans are showing backlash on the internet, and reacting in disappointment that a list of other Black artists weren’t chosen to represent the most famous Record label, that was built by, for, and around black people, in Black History Month. News Outlets: #JenniferLopez will perform a #Motown tribute at the #Grammys on Sunday. 6ix9ine pleads Not Guilty. To Stay Locked Up until September 2019. Gina Rodriguez’s aunt, Jennifer Lopez Cries as she asks Why y’all attacking her Motown Tribute This Black History Month?